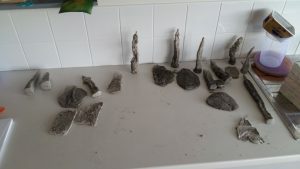 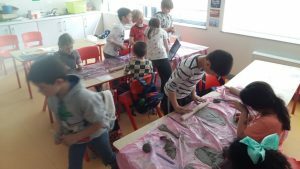 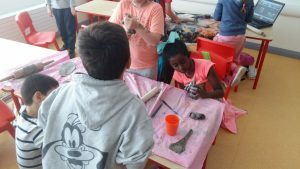 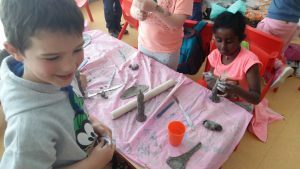 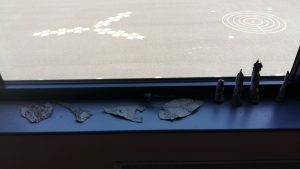 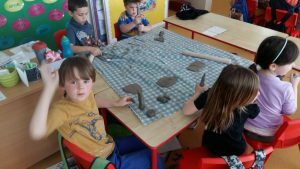 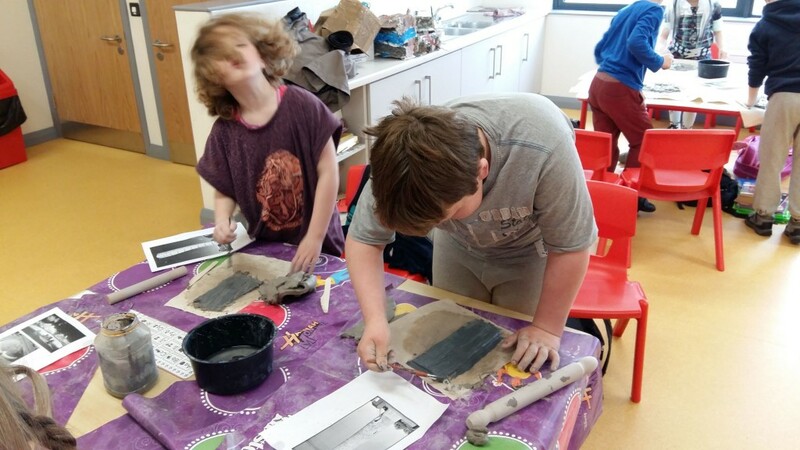 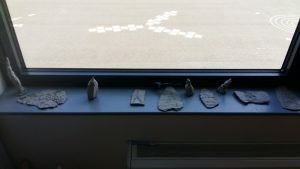 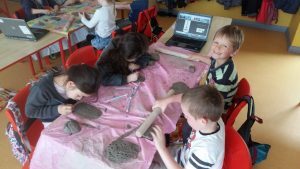 Jonathan’s First Class looked at European buildings in Art and inscribed the Eiffel Tower and constructed Big Ben in clay. 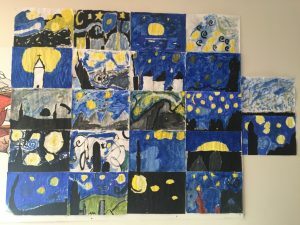 Aisling’s Third Class were inspired by the famous Dutch artist Vincent Van Gogh. 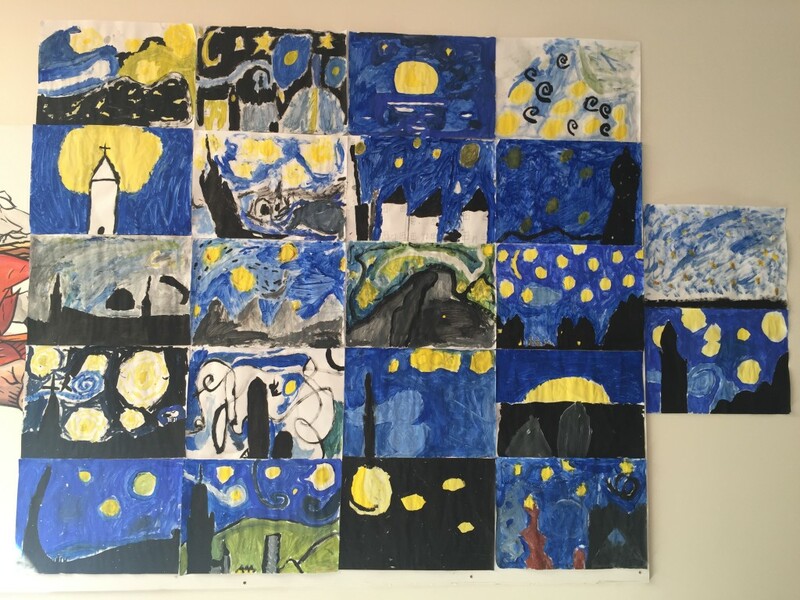 They created their own versions of his beautiful painting ‘Starry Night’. 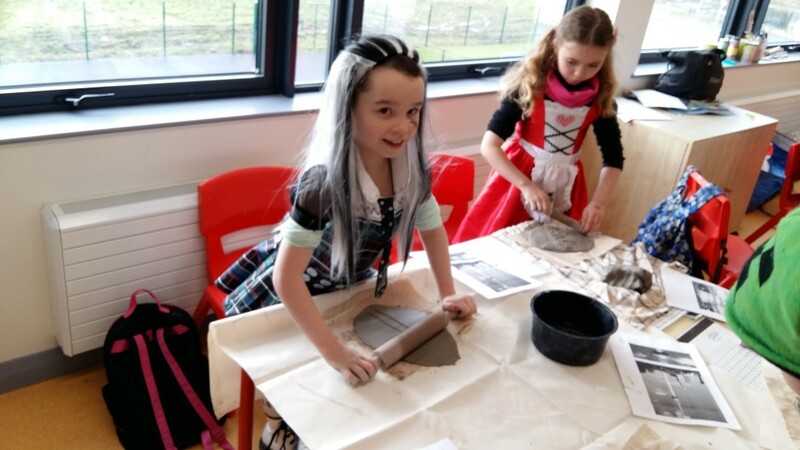 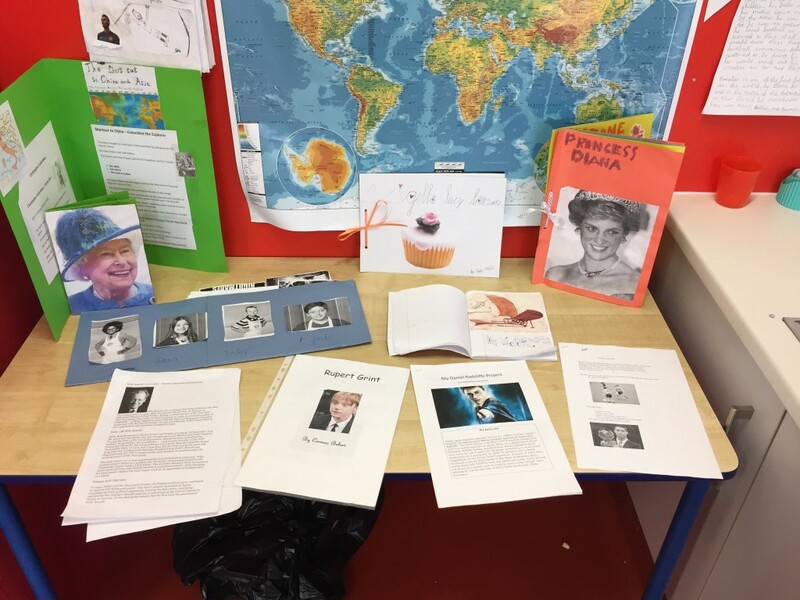 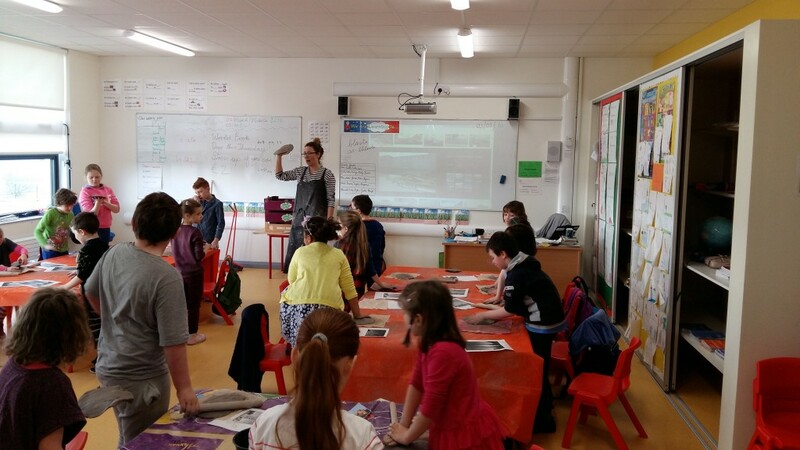 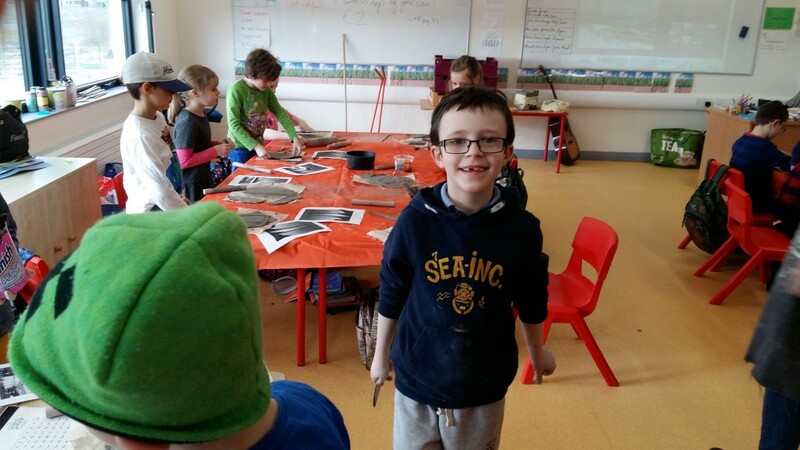 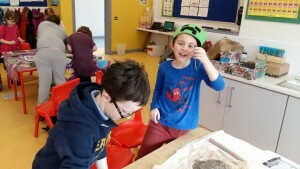 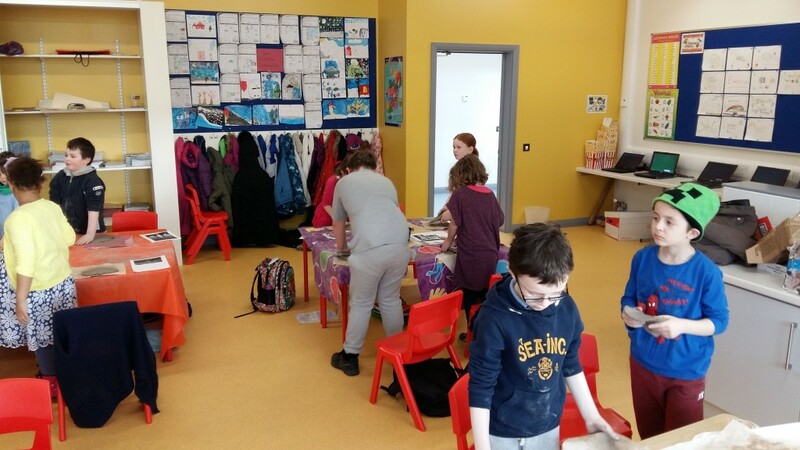 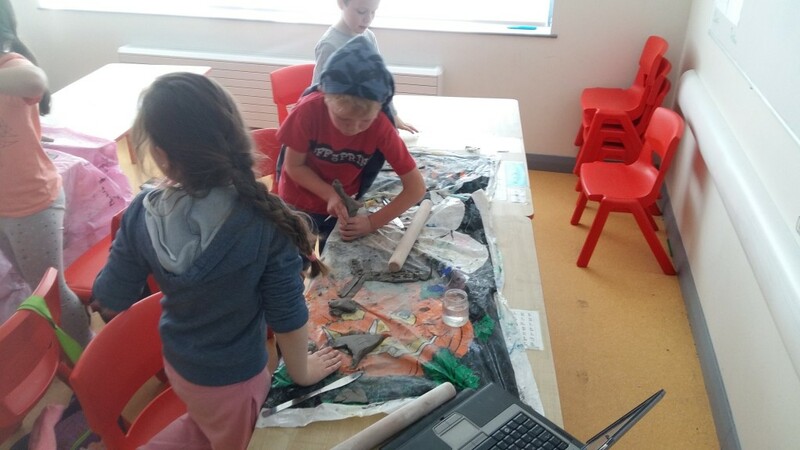 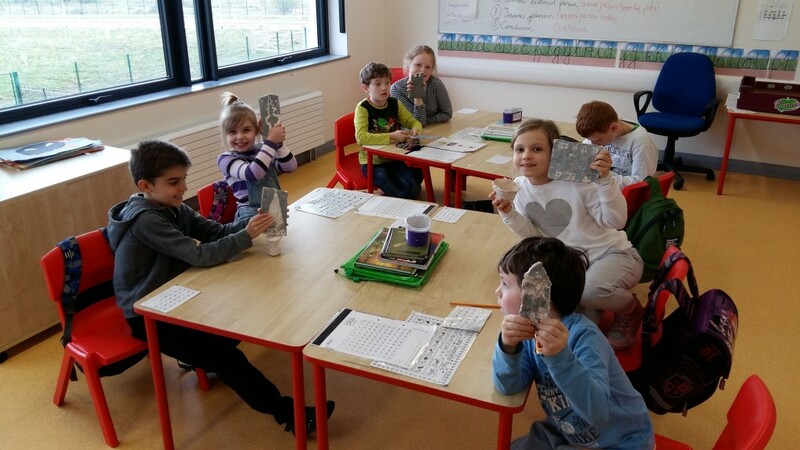 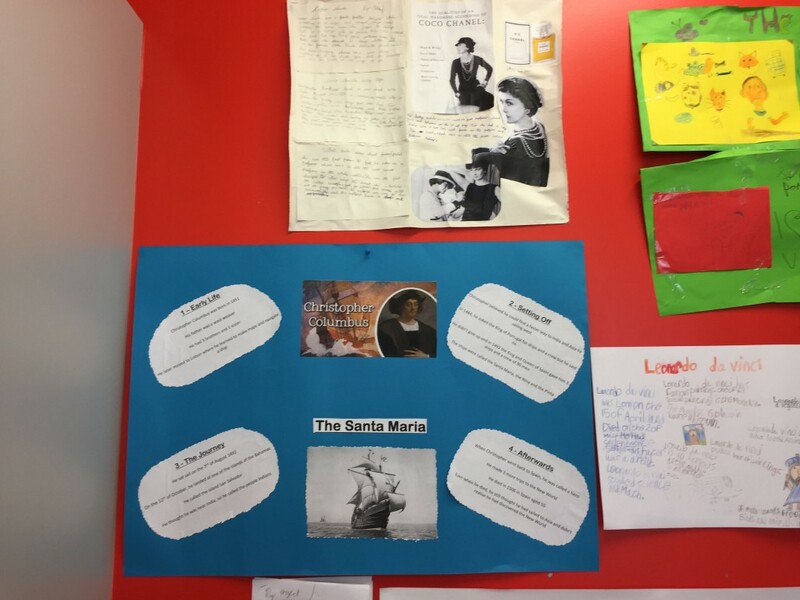 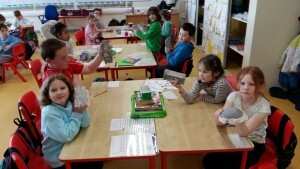 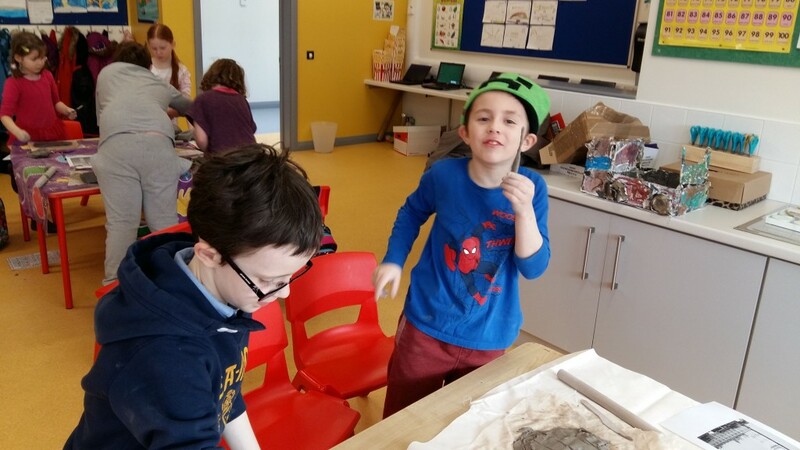 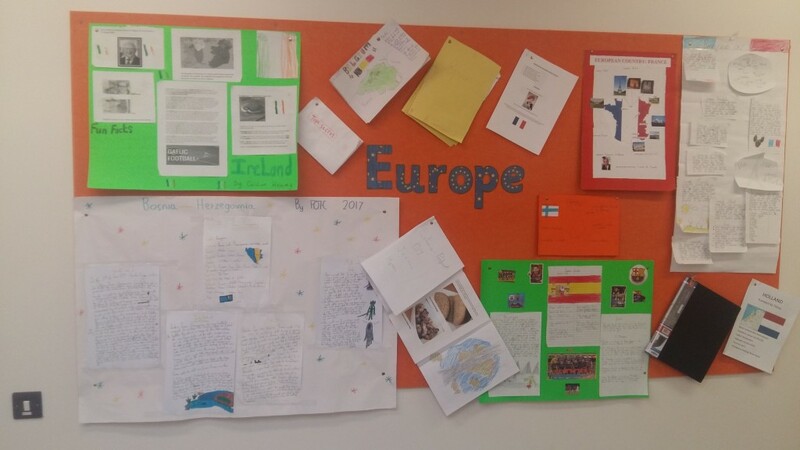 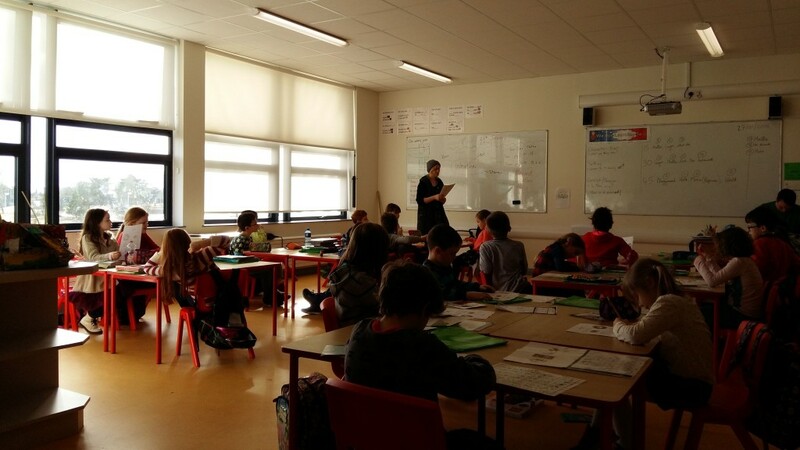 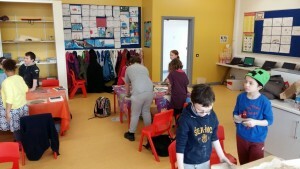 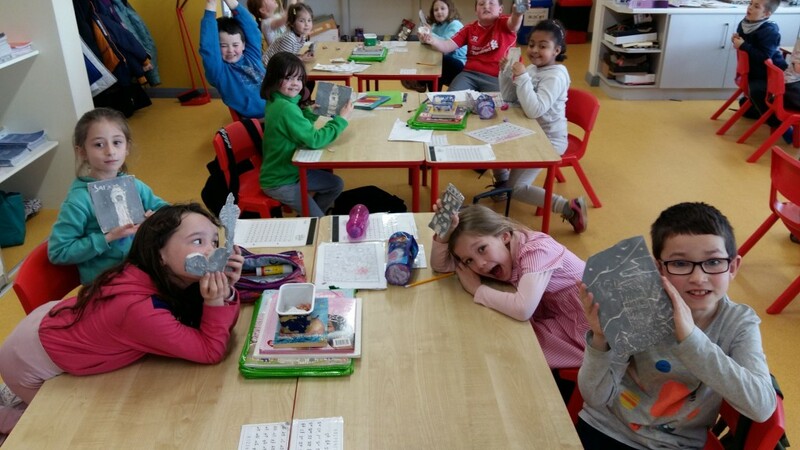 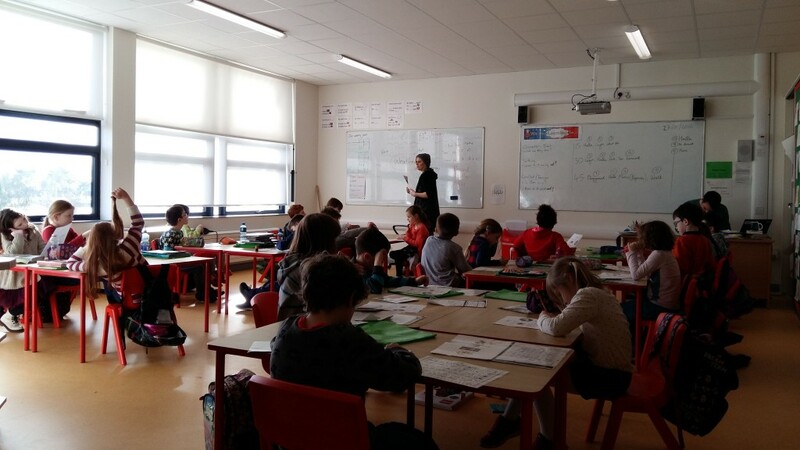 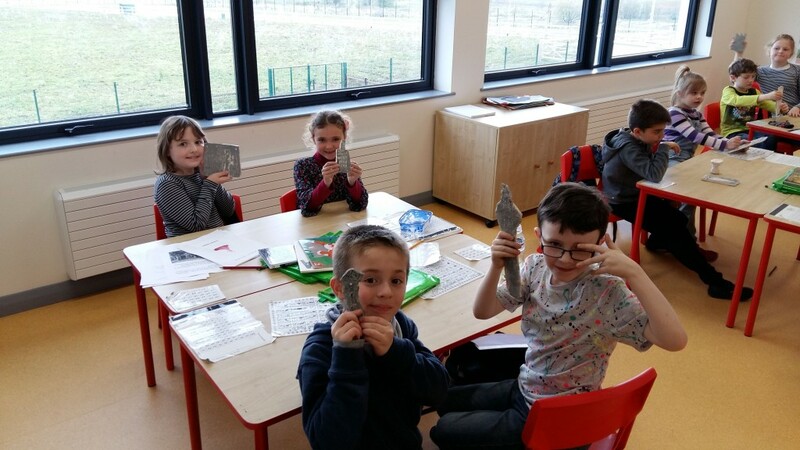 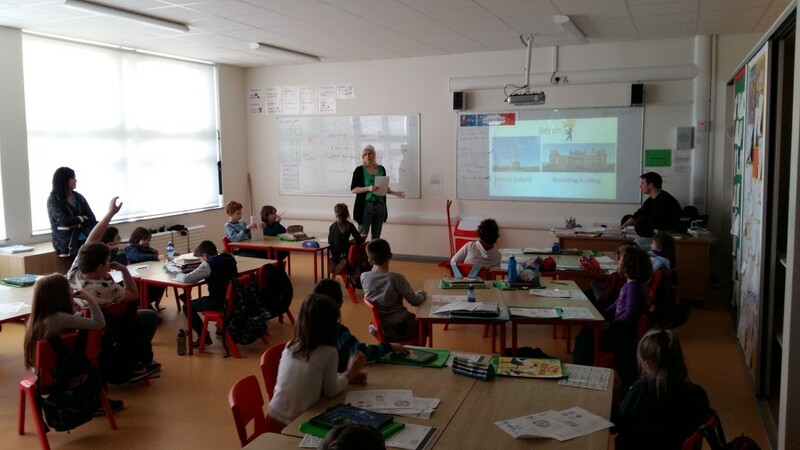 Oisín’s Fourth Class have focused on culture, history, landmarks and famous people within European countries. 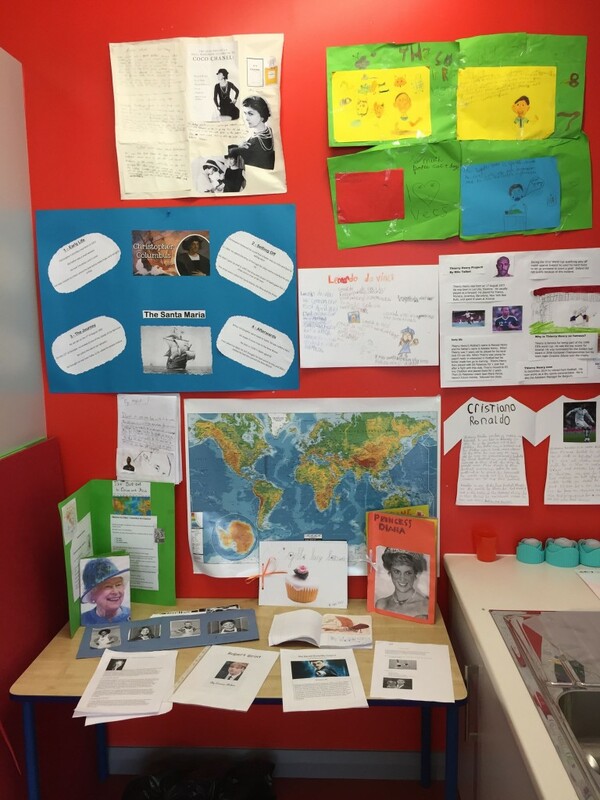 Students had the choice to present their project in any form they wished. 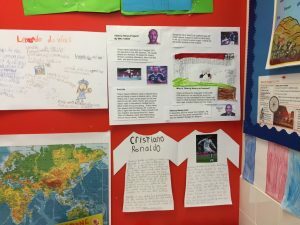 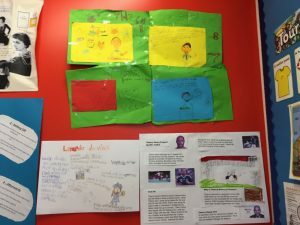 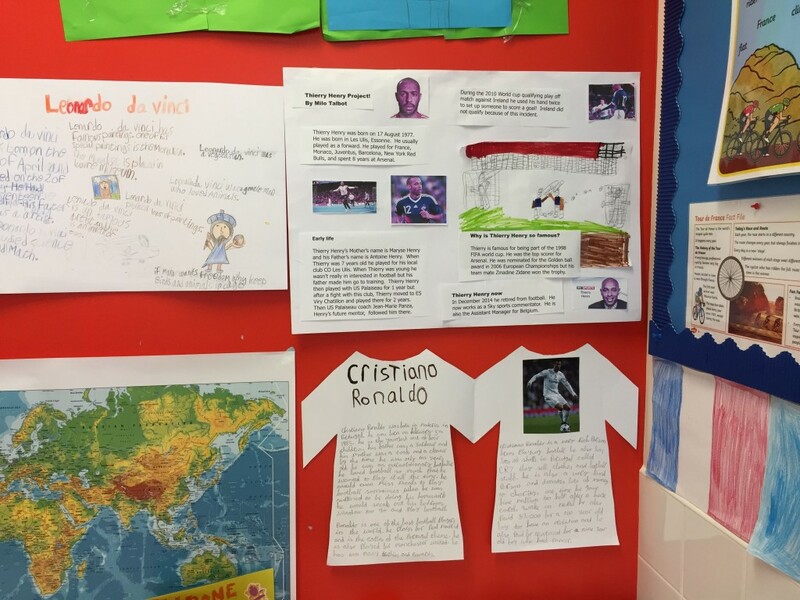 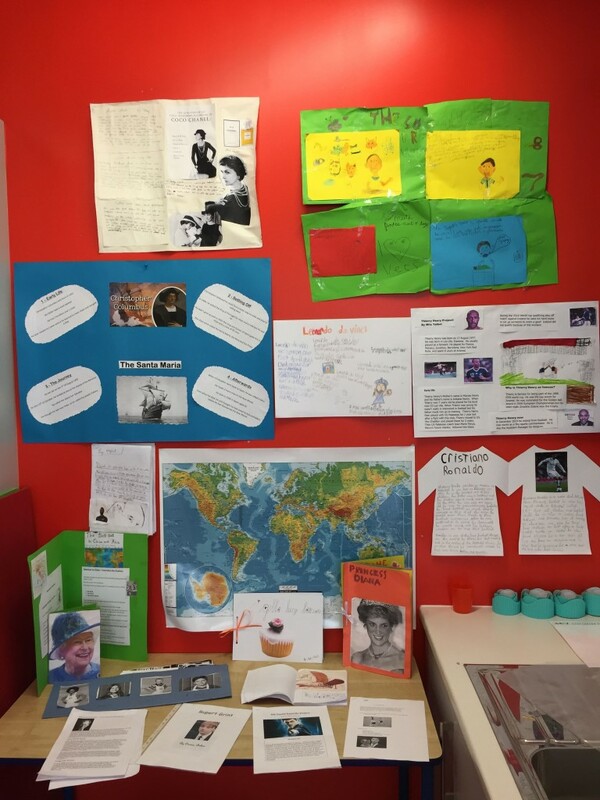 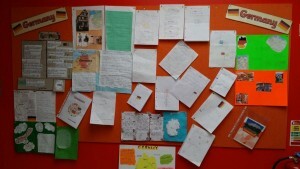 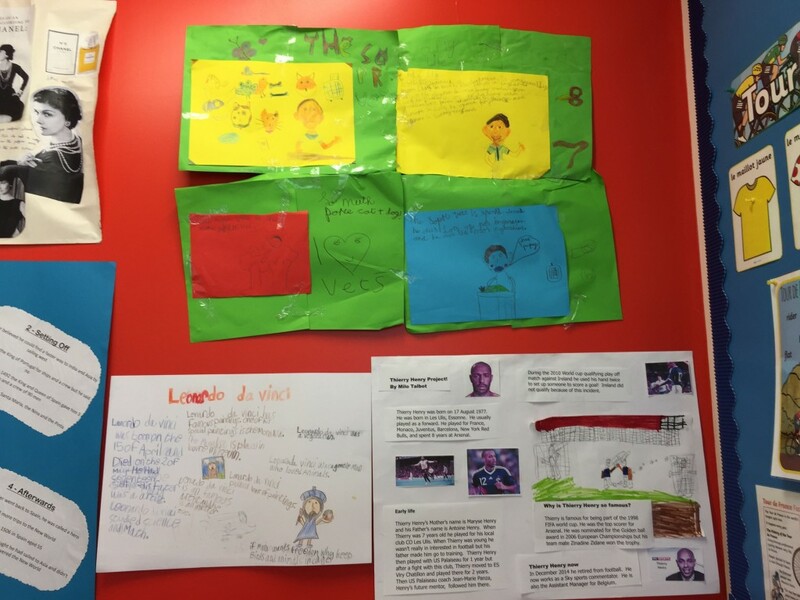 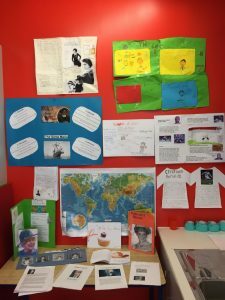 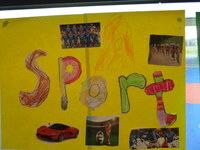 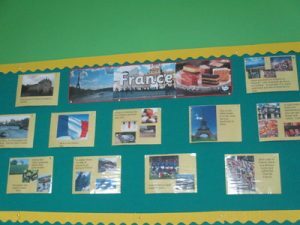 Examples include booklets, PowerPoint, fact file and portfolios which were put on display. 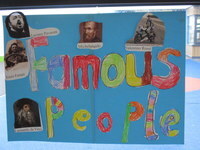 Gary’s Second Class researched famous European people. 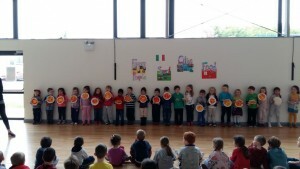 Here’s a video of Orla’s Junior Infant class giving a great presentation, and singing, about France during Assembly. 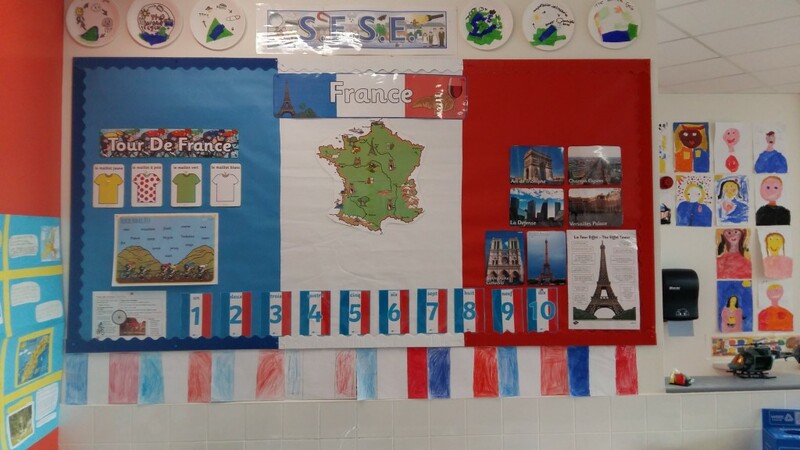 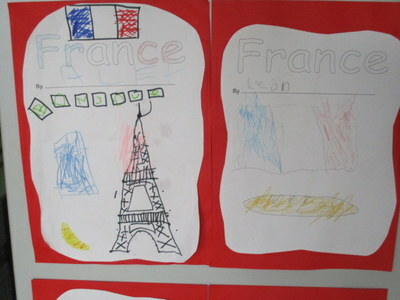 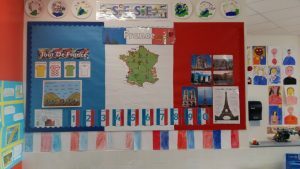 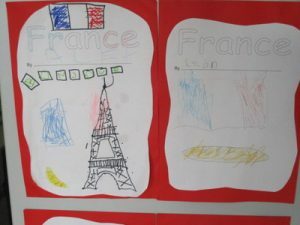 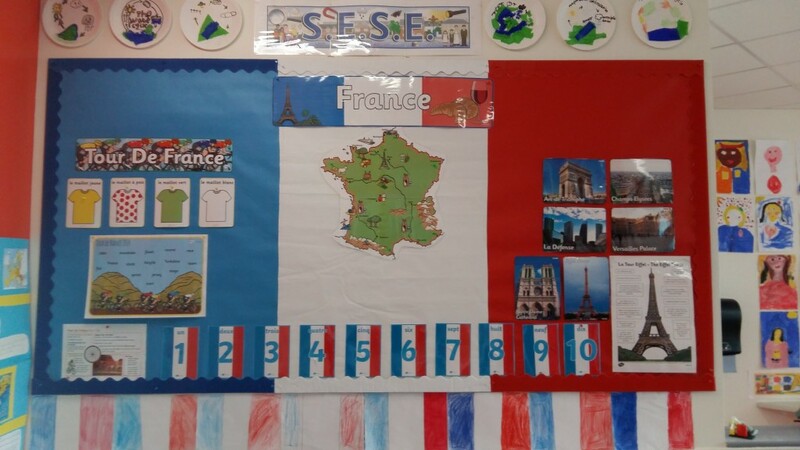 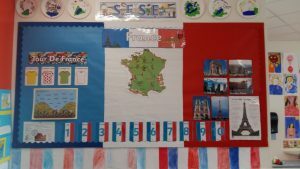 Junior Infants loved learning about France. 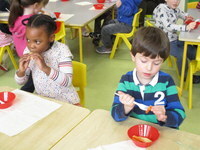 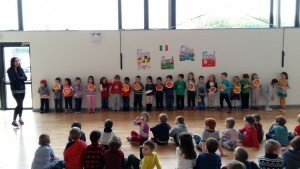 They learned French phrases, tasted French foods and learned a French song which they performed at assembly. They did projects about France for homework and painted French flags in class. 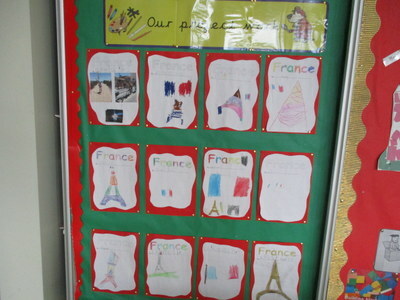 They particularly enjoyed following Barnaby Bears tour of Paris on the interactive whiteboard. 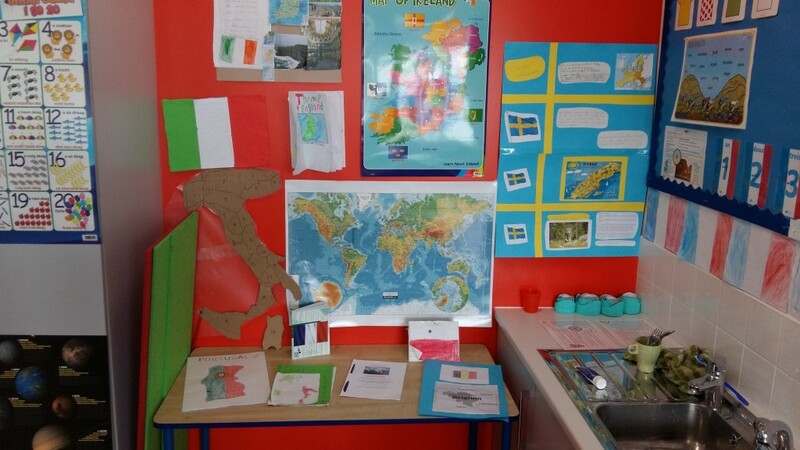 Aisling’s Third Class did amazing research on different European countries. 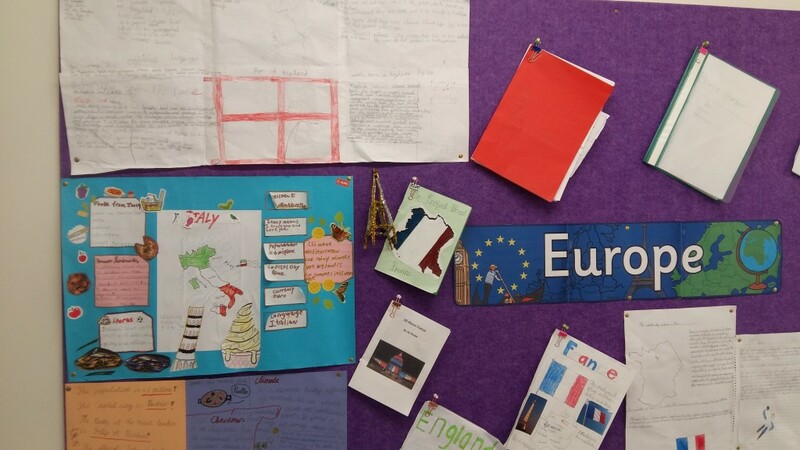 They drew maps and flags and researched capital cities, the meaning of the country’s name, population and many other areas including, for example, clothes, food, famous landmarks and sport to name but a few! 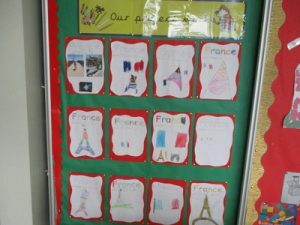 Aisling’s class have also been learning about Poland. 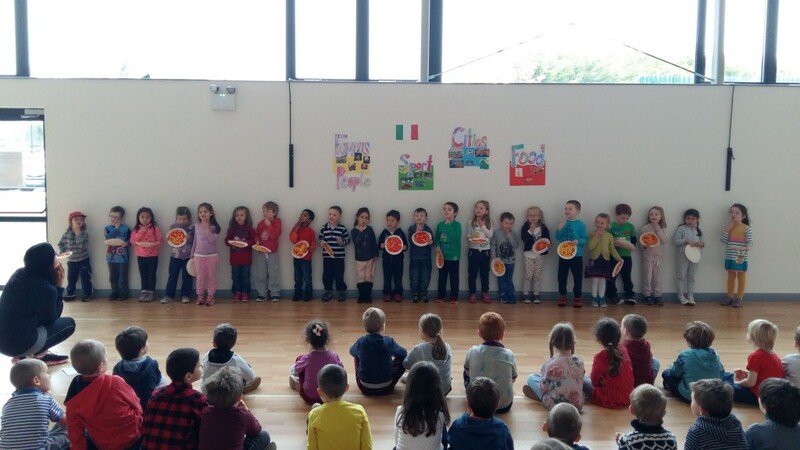 One of our SNAs, Maciek, visited their class and answered lots of questions they had about his country. 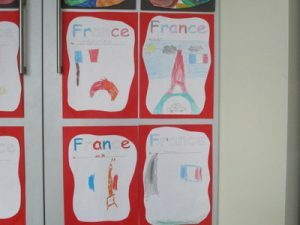 Gary’s Second Class have also researched European countries and produced these masterpieces! 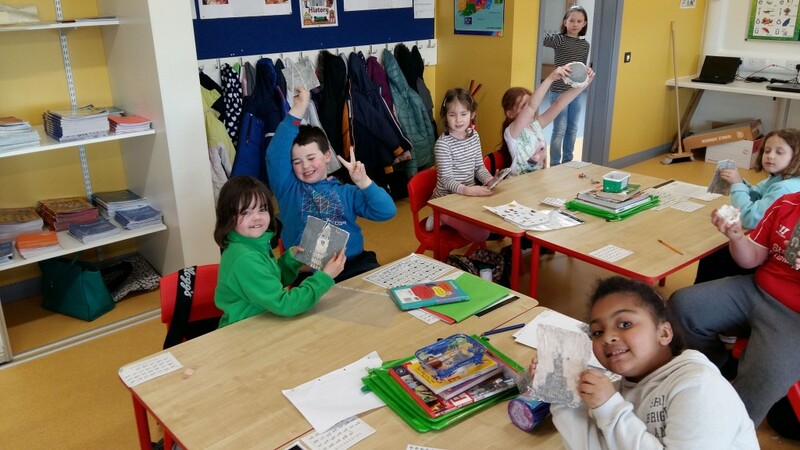 First and Second class were delighted with their finished clay European buildings and monuments! 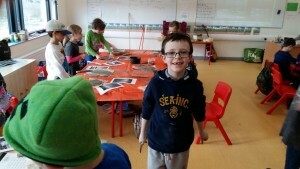 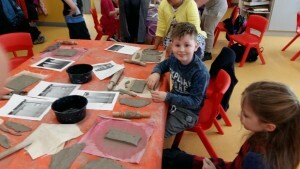 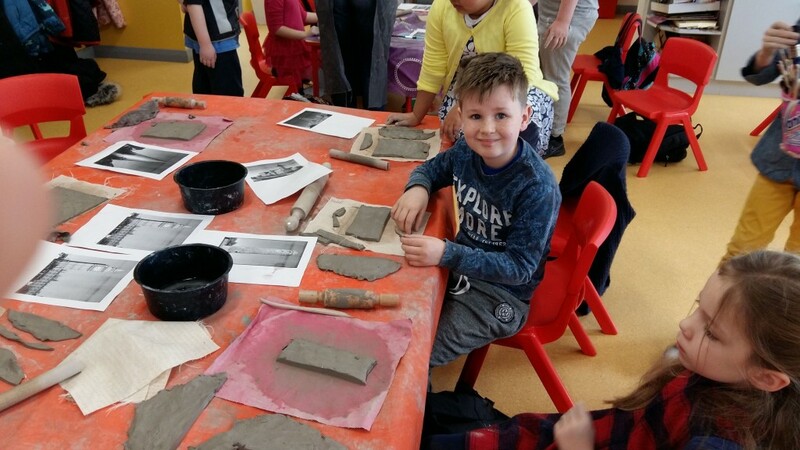 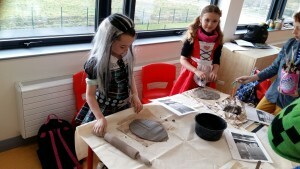 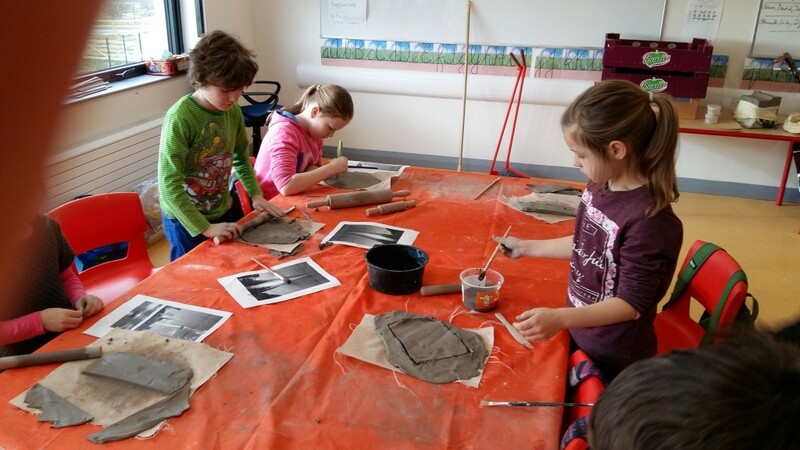 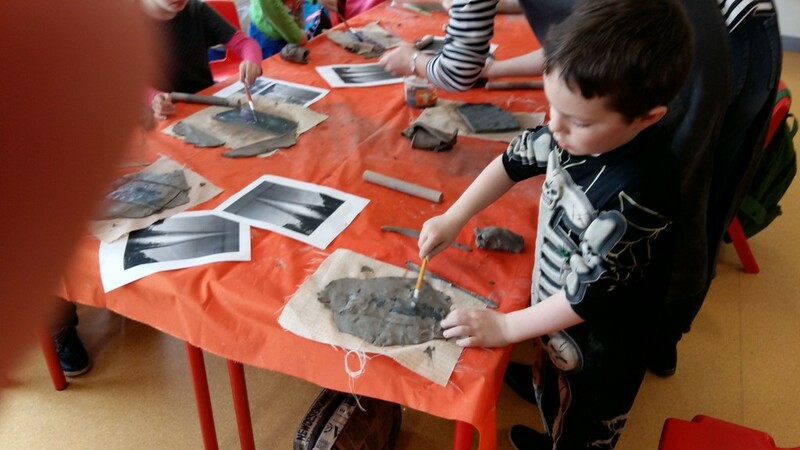 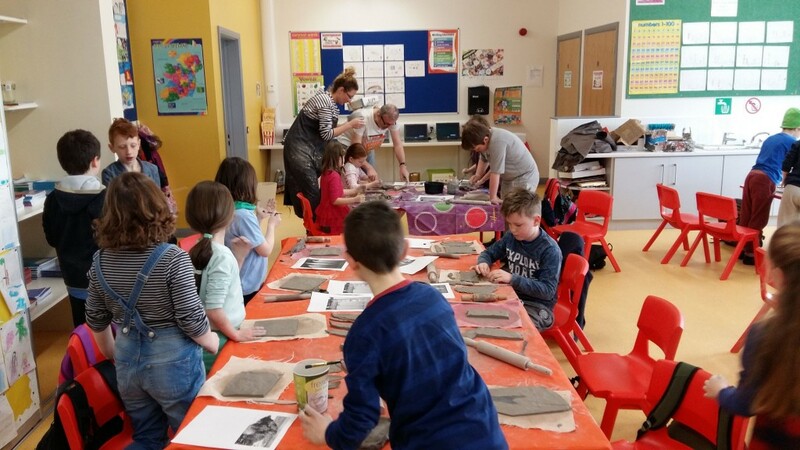 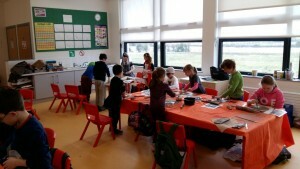 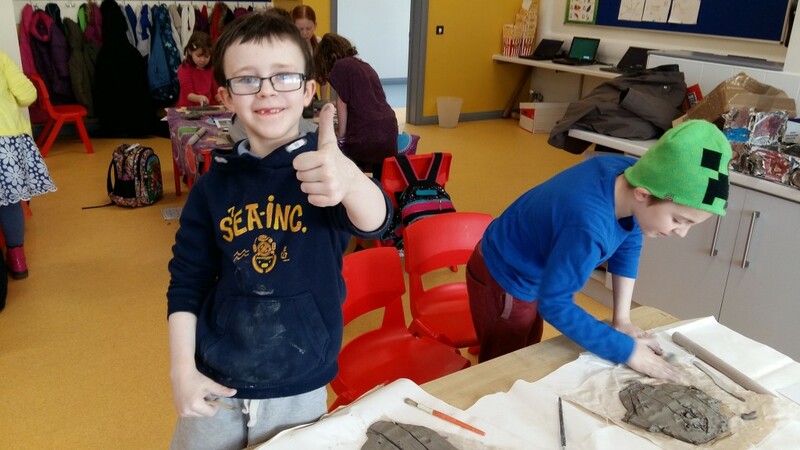 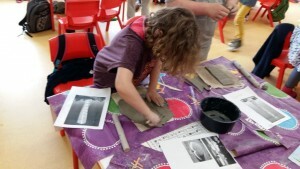 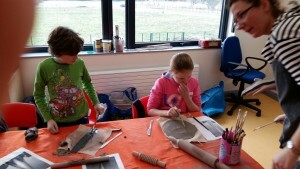 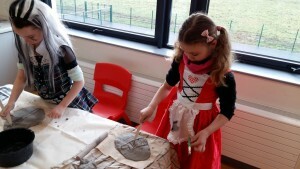 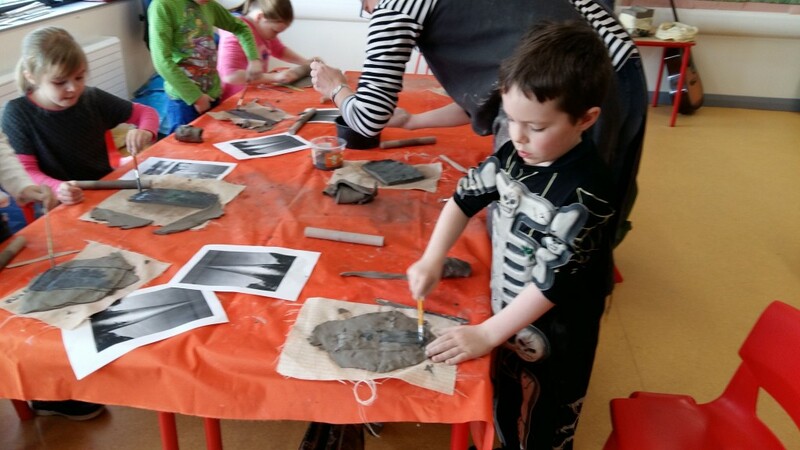 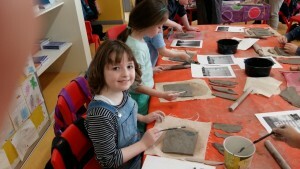 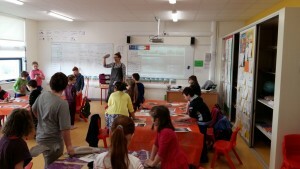 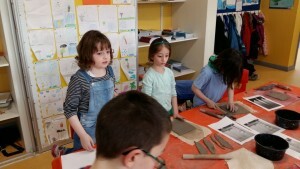 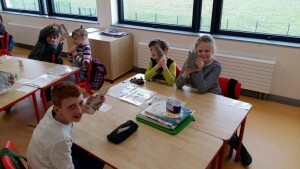 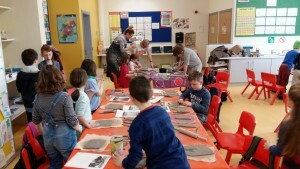 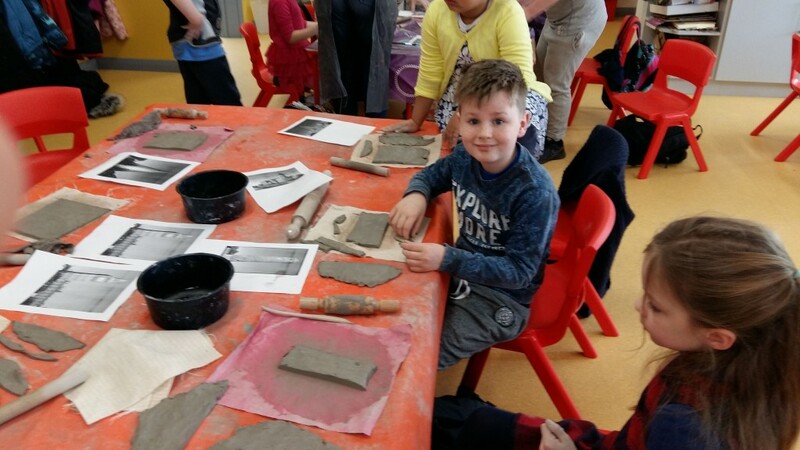 Jonathan’s First and Second Class chose a range of European buildings and monuments for art ceramic lessons with Ania. 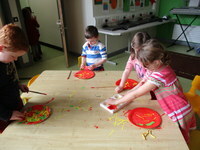 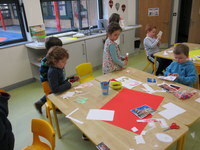 Here they are busy at work creating their masterpieces! 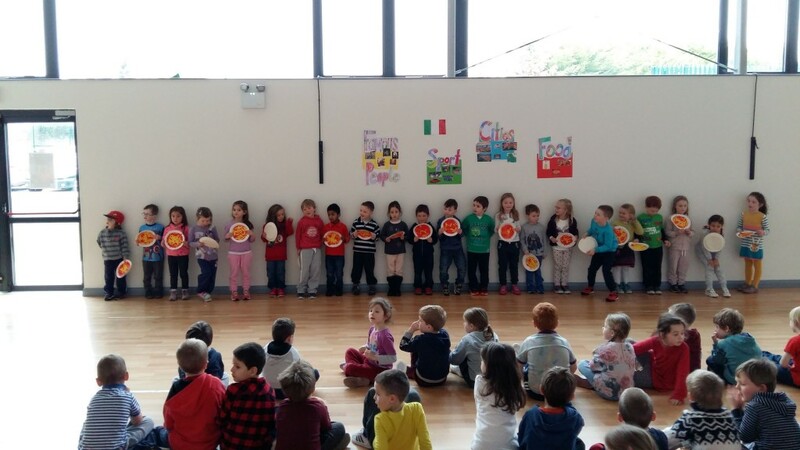 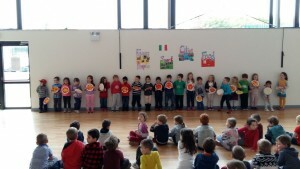 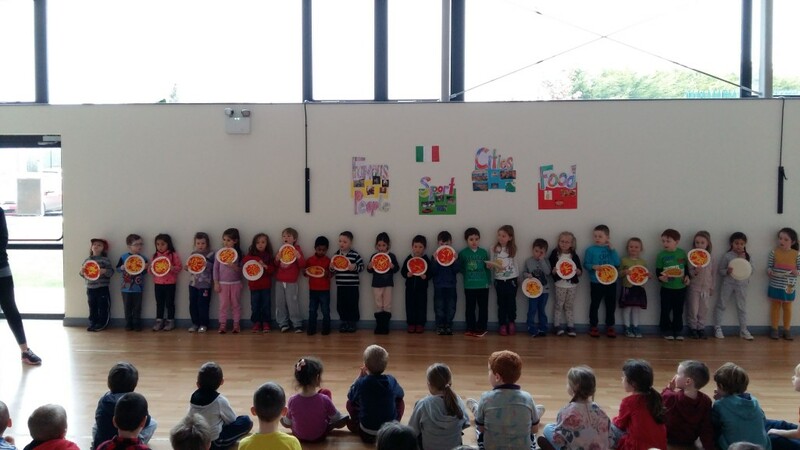 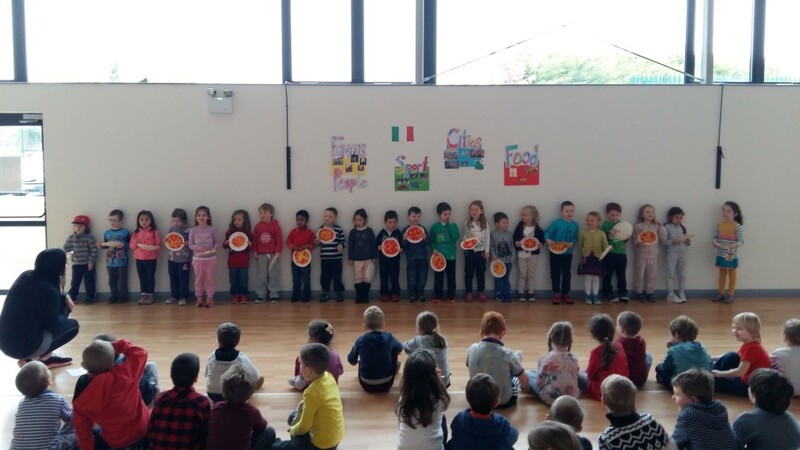 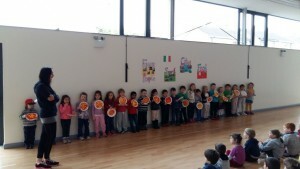 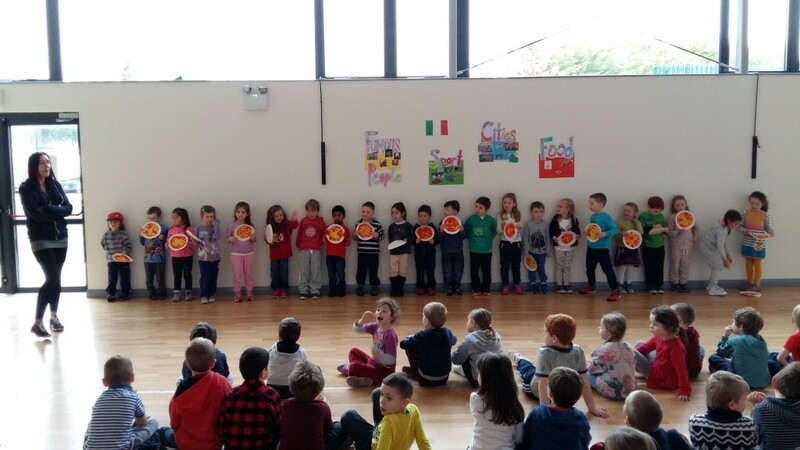 Rosie’s Junior Infants were brilliant at assembly showing everyone what they learned about Italian culture including cities, food, sport and famous people. 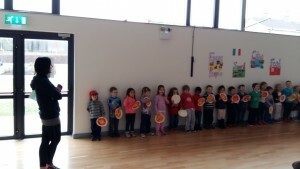 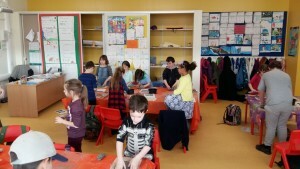 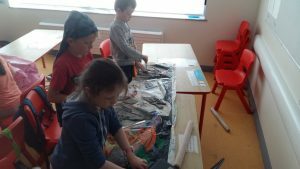 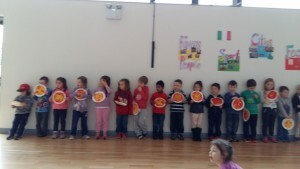 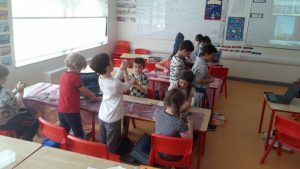 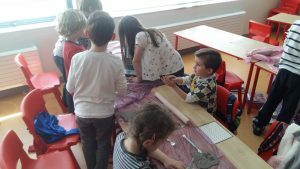 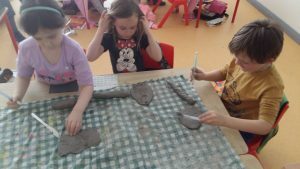 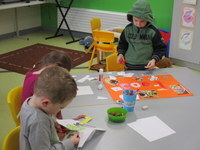 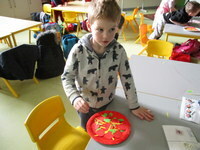 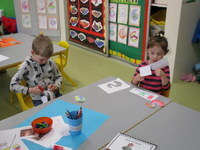 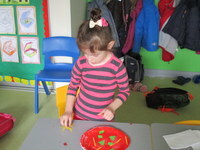 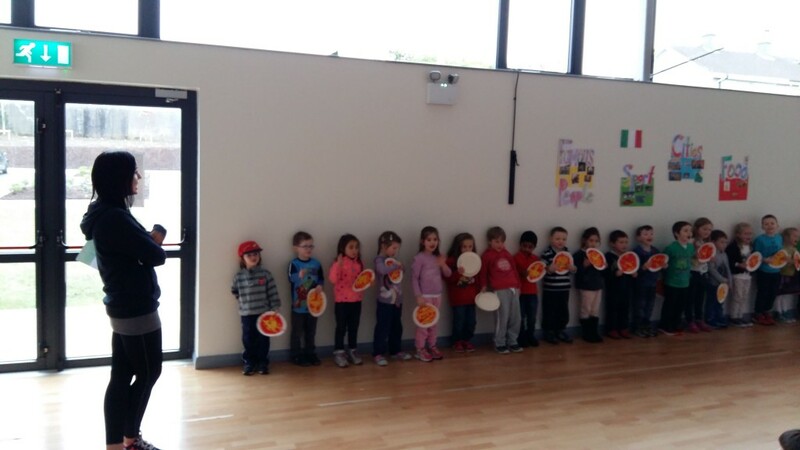 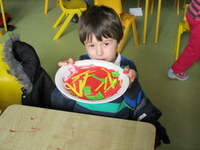 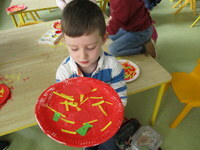 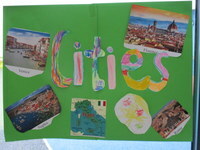 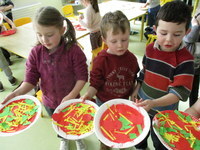 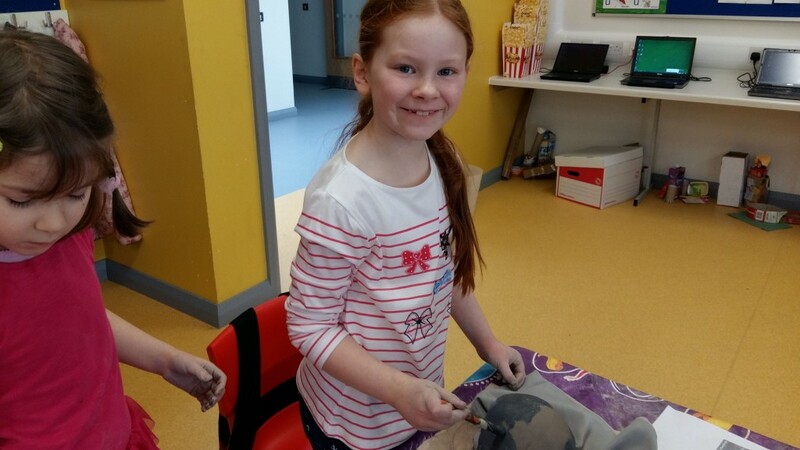 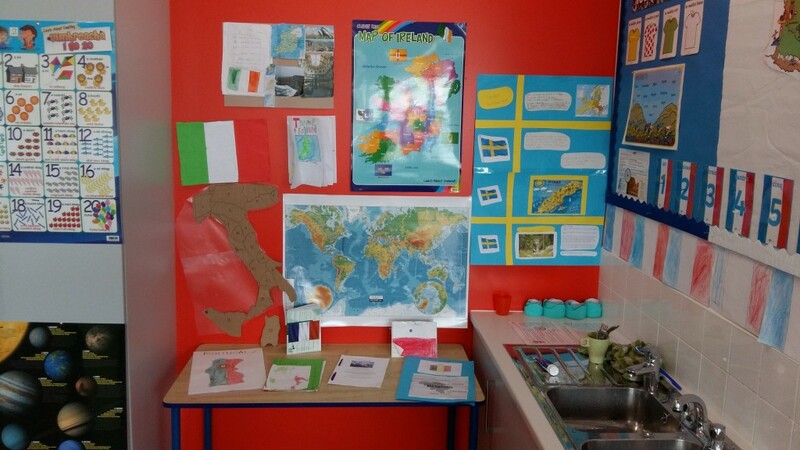 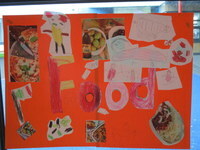 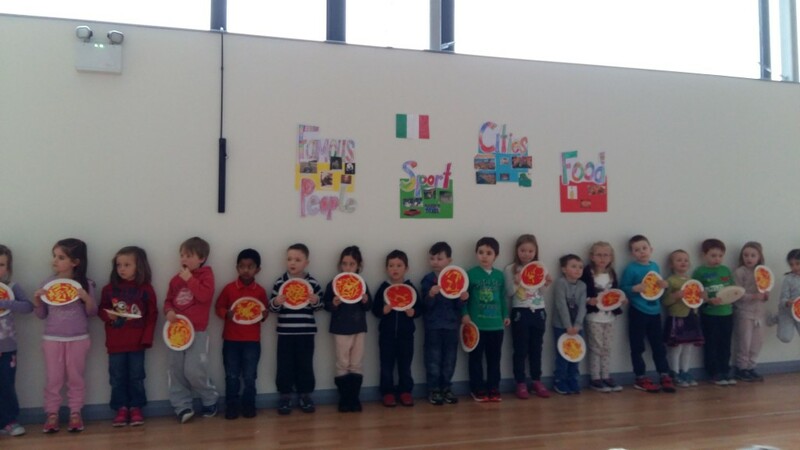 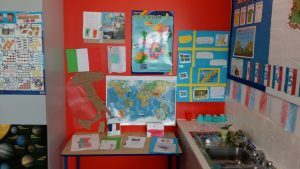 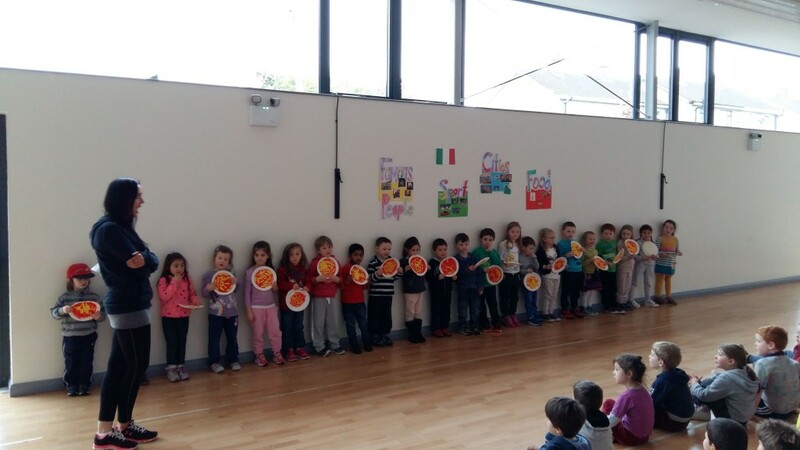 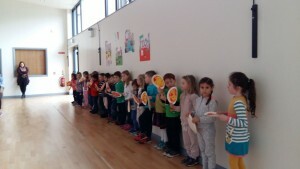 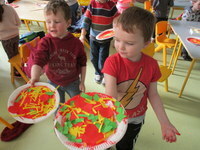 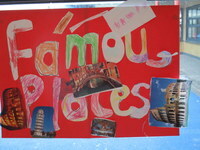 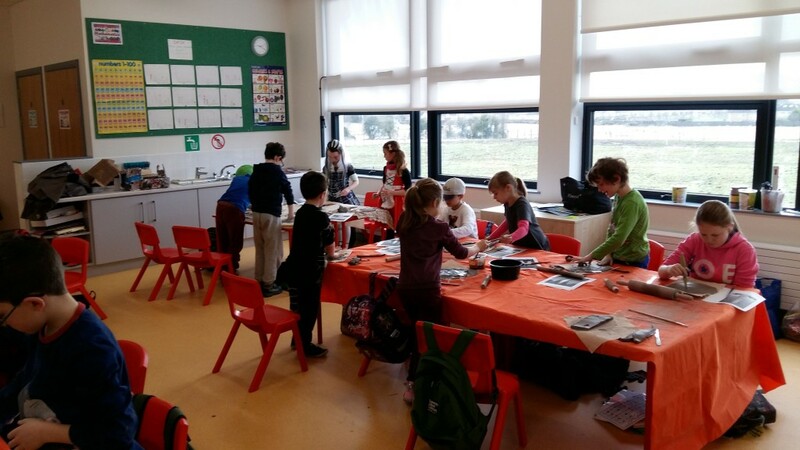 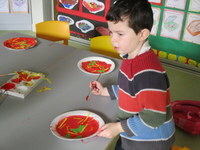 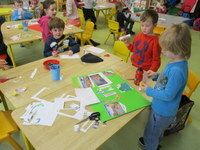 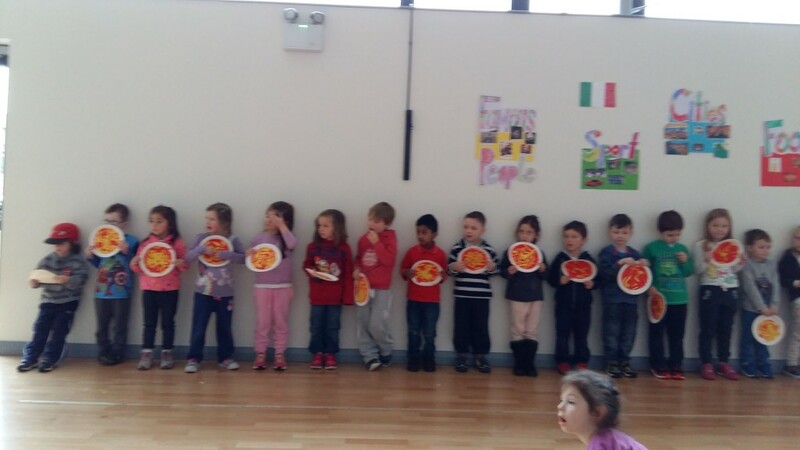 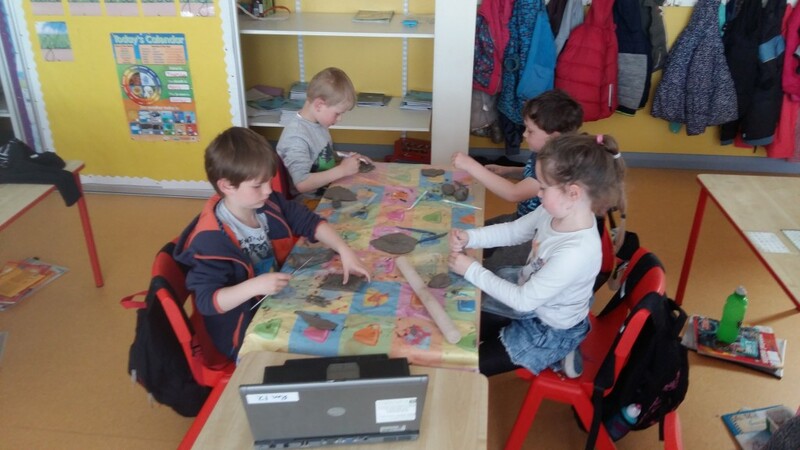 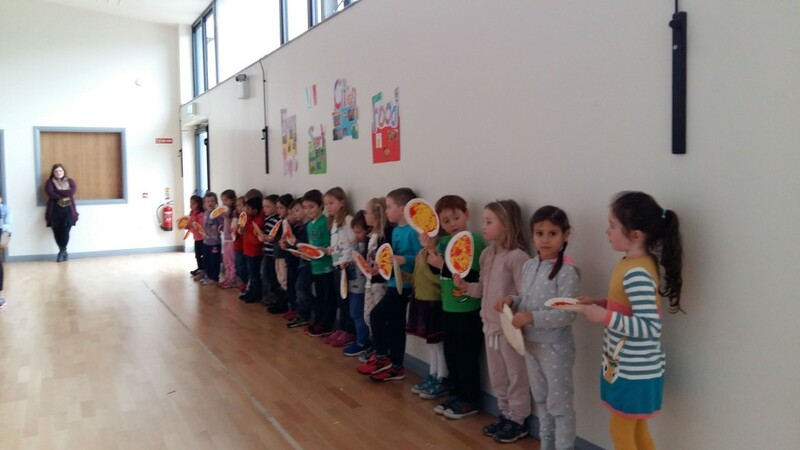 Orla’s Junior Infants learned all about Italy tasting Italian foods, doing cutting and sticking projects on Italy and even designing their very own pizzas. 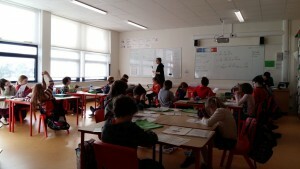 They also learned some simple Italian words and phrases. 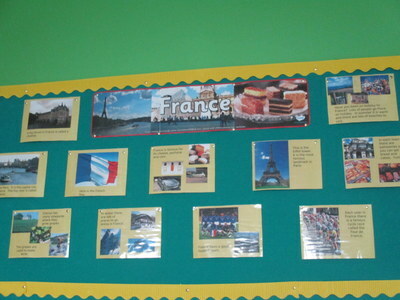 Jonathan’s class are learning about German geography, history, culture and music. 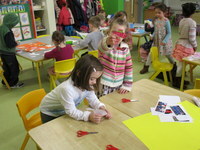 We are very lucky to have weekly classes from our German guests up until the mid-term break! 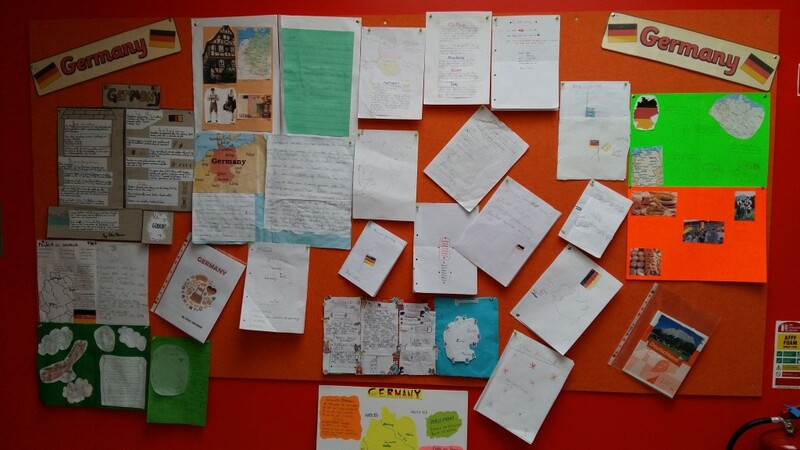 Aisling’s class researched Germany and produced excellent projects based on their work. 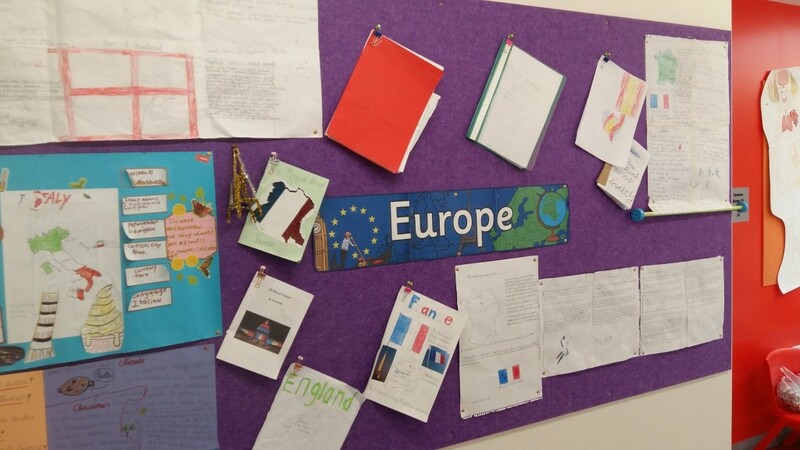 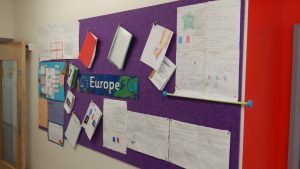 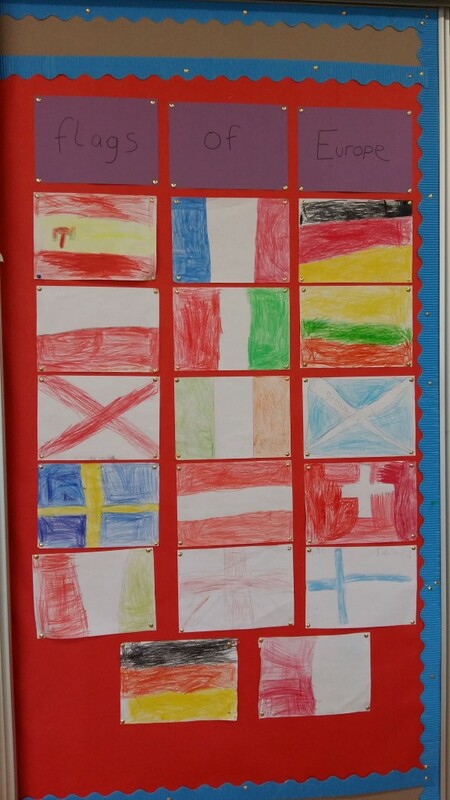 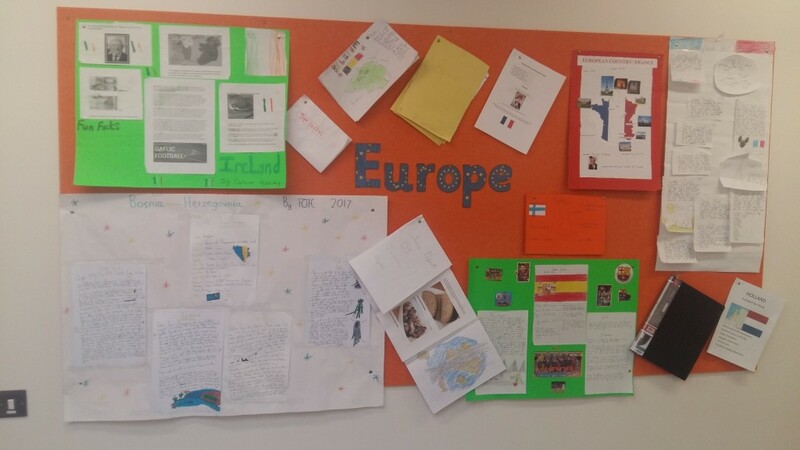 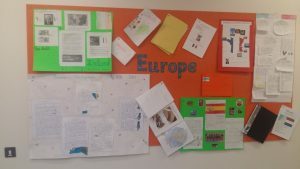 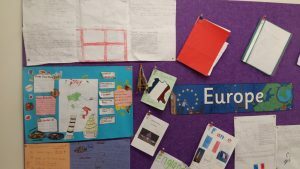 Josh’s class celebrated their European diversity as the children discussed where they,and their families, are from throughout Europe. 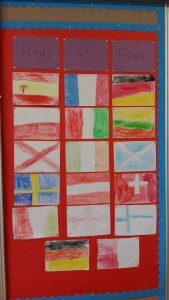 They spoke about favourite holiday destinations in Europe and designed European flags during Art. 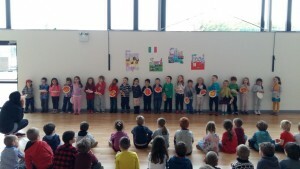 First class had their most fun singing ‘Hello’ in different European languages during assembly.